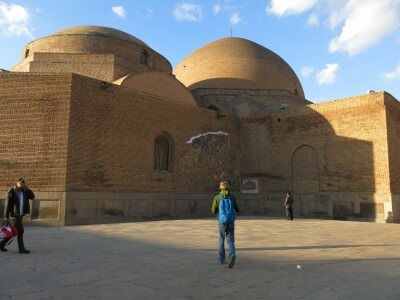 Another of my posts on backpacking in Iran as today I cover my top 5 sights in Tabriz. 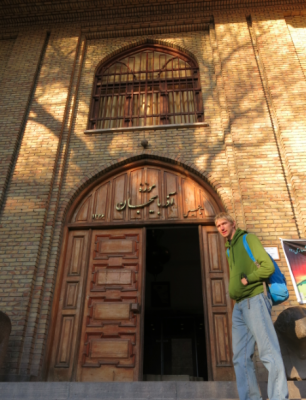 Tabriz was our first proper stop in Iran after crossing from Turkey on the Gurbulak to Bazargan border. 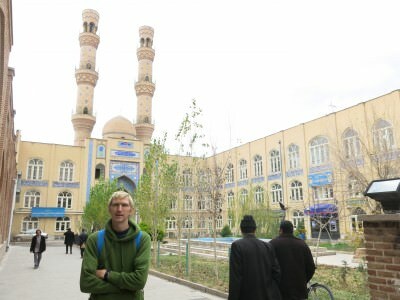 We ended up spending 3 days in Tabriz. We randomly met another backpacker in Maku just after crossing the border. It was a Canadian guy called Marin. 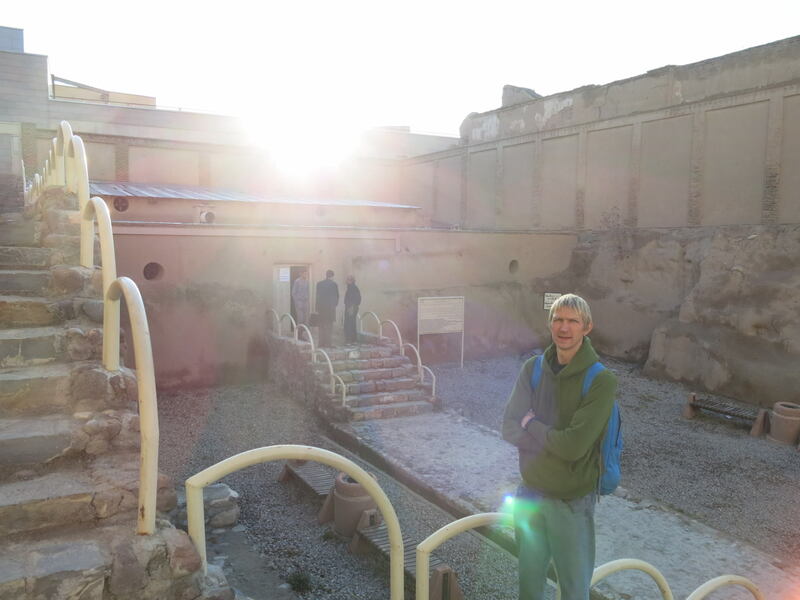 He hung out with us the first night and day in Tabriz. Backpacking in Tabriz with Marin and a local lad. My top 5 sights. Where to stay in Tabriz. Like a lot of my travels in Iran and the Middle East, there is no real need to book your accommodation in advance. Hotels are plentiful, average and rarely sell out. We spent the first night in the Darya Guesthouse which was a tad dear. We just booked it when we got there. 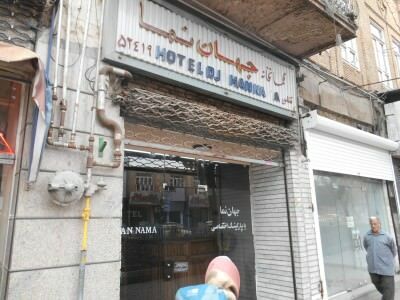 The second two nights in Tabriz we stayed in the Hotel DJ Hanna which was cheap and basic but suited us well. Neither of these hotels had free breakfast. Both had hot showers. One had an external toilet only. We stayed in the Hotel DJ Hanna in Tabriz. 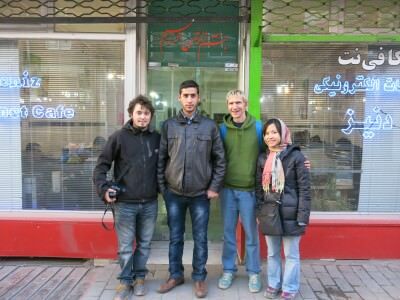 Most backpackers visiting Tabriz will either have just come in from Turkey or be heading to Turkey. Bus is the preferred option to get to and from Tabriz. 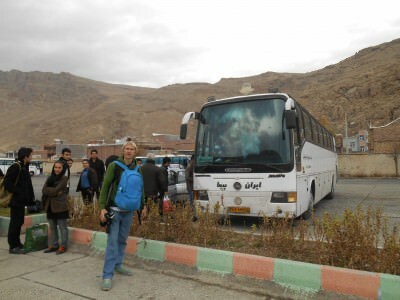 We arrived on a bus from Maku and departed on a nightbus to Qazvin. You can also come in via Orumiyeh which is another city near the Turkish border. We also visited Orumiyeh but only on a day trip. In Maku about to board our bus to Tabriz in north western Iran. This Mosque will not only rival Istanbul’s gem of the same name, but relegate it to the sidelines, at least that was my belief. Tabriz’s Blue Mosque has survived an earthquake, is a lot less touristy and is also a bit more blue! You’ll have the place all to yourself! The interior of the Blue Mosque in Tabriz, Iran. Any disappointments I had when checking out the bul’s top tourist attraction were made up for as we admired the Blue Mosque in Tabriz. There’s a 100,000 Rials entry fee sadly – Iran knows how to charge foreigners for popular sights – locals pay just 15,000 Rials. Once inside you can admire its mosaics and beauty. The external courtyard is also amazing to look at. You might be surprised to hear that Tabriz and this region of Iran is actually mostly Azerbaijani people. The name of the region is East Azerbaijan. The museum also charges 100,000 Rials entry. If you’re into Azeri history you’ll pay it and not bat an eyelid. The Azerbaijan Museum in Tabriz, Iran. Iran and Tabriz in particular is famous for carpets. 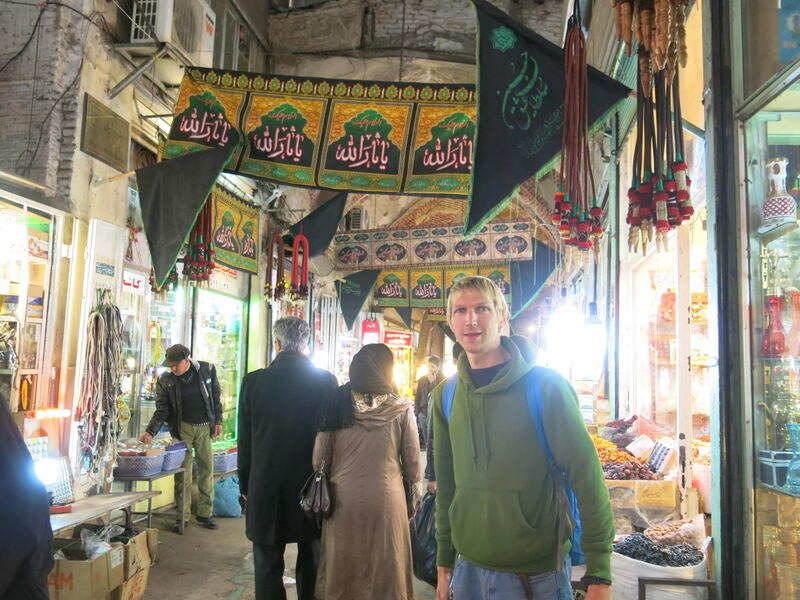 Tabriz has a major Bazaar which is long, confusing, eclectic and seems to run for miles. You can get lost inside. From gold to sweets to toys to carpets to clothes, this market is massive. Spend hours browsing and bargain the price of things! Top sights in Tabriz in Iran – the massive bazaar has to be done! The Iron Age Site Museum featured old bones (human!) and some relics that have been dug out of the ground. It’s a really bizarre place actually and is situated at the end of what looks like a shopping centre but instead is a load of printer shops and offices that looks like a shopping centre. It’s signposted from the back part of the Blue Mosque. It’s free entry. Touring the unusual iron age site museum. You’ll hear me say this way too often – but every big town or city has a Jameh Mosque. It’s the standard. The thing is when it comes to choosing a top 5 or top 7 or top 11 in a town, it’s hard not to include the Jameh Mosque in it. Outside the “old” Jameh Mosque in Tabriz, Iran. There are TWO in Tabriz – the old one which is still in use and is on the edge of the Bazaar and the new one which was still being finished when we were there (December 2013). I visited them both. Tabriz has a few other sites by the way but we concentrated on these 5 and also loved our trip out to tour Kandovan Cave Village. As a final cool budget backpacking tip – LOCAL buses are FREE for foreigners! They don’t charge you. Basically the locals all have a swipe card that they use to pay – there is no conductor and the Tourist Information Office told us that there is no way for a foreigner to pay so we don’t! Bonus! 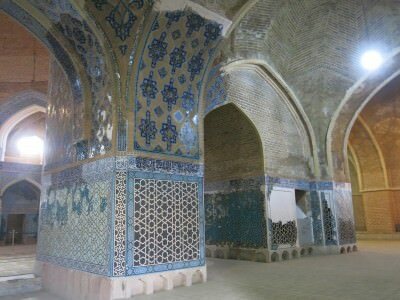 This entry was posted in Central Asia/Middle East, Destinations, Iran, Lists, My Top 5s, Tabriz. Bookmark the permalink. Amazing Videos Jonny! I really enjoyed watching them. I’ve been to Iran twice myself and just wrote a huge Guide to Backpacking Iran including everything you need to know before going there as a first timer. When did you come to Tabriz ? I like Italy very much but I don’t go there until now. I hope one day I see Italy.